On Saturday, February 4 the Confederation of European Baseball held its annual congress as part of the joint 2017 ESF-CEB Congress in Belgrade, Serbia. 32 member federations were present for the European Baseball gathering, which also included elections to the CEB Executive. Didier Seminet (France) was elected unanimously as new President. Didier Seminet’s predecessor Jan Esselman withdrew his candidacy for a second term prior to the elections and was giving a standing ovation from the federations as sendoff. 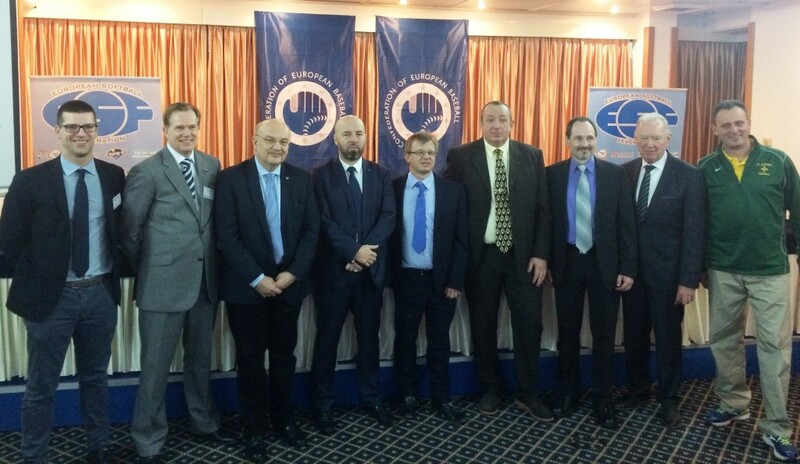 Additionally elected to the Executive Committee were 1st Vice President Petr Ditrich (Czech Republic), 2nd Vice President Jürgen Elsishans (Germany), 3rd Vice President Rainer Husty (Austria), Secretary General Krunoslav Karin (Croatia), Treasurer Rene Laforce (Belgium) and members at large Roderick Balk (Netherlands), Marco Mannucci (Italy) and Oleg Boyko (Ukraine). The CEB Congress 2017 was also attended by several guests including WBSC President Ricardo Fraccari, WBSC Treasurer Angelo Vicini, WBSC Executive Director Michael Schmidt, Dan Pelt from Little League International, Jan Bagin from Pony, ESF President Andre van Overbeek and Serbian Softball Federation President Slobodan Djuric as host of the 2017 congress. During the congress also the 2016 awards were announced and handed out. Erika Sojat from Italy was named scorer of the year, Serge Makouchetchev from France umpire of the year and Steve Janssen from Belgium, head coach of the Dutch national team, as coach of the year. Jason Holowaty, who’s stint with MLB Europe Development Director ended at the end of 2016, was honored with the special Xavier Mateu Award for his services to European Baseball. The Polish Baseball and Softball Federation was named Federation of the Year. Besides the awards handed out from the Confederation of European Baseball (CEB) Little League International honored Sweden with the 2016 country of the year award, while PONY League Baseball honored the Czech Baseball Association (CBA) and the German Baseball and Softball Federation (DBV). The 2018 joint CEB-ESF Congress will be held in Paris, France on February 10, 2018.